THE GREAT MAN’S house. The daughters of the men who cracked his anthracite cracked oysters for him in there. The girls would come home and say they had a place in the great man's house and would rub shoulders with quality, pa. The fathers knew him, though. A werewolf. A vampire. They would sit silent with their black faces and their watery eyes at the kitchen table and know what it meant to turn your children over to such men. They'd say nothing because there was nothing to say. They turned their sons over to the collieries. There was honor there -- and shame. A man hopes for better for his children than he got. Nothing ever gets better in a mine. You come out every day like the womb. Born again. Or not. The great man would read of the little men like insects that worked in his seams, dead of the gas or the great hand of gravity. It was a story from far away, as their very daughters cracked his oysters. The men would see their sons fight back the plain fear that showed in their eyes as the sky passed away and the rank earth swallowed them for their labors, and feel pride, too. No man is ashamed of his son at his elbow in a mine. He is ashamed of himself, maybe. What is a man to do? A Welshman might as well be a black ant. He's got the instinct to go down and up in that little hole and he can't help himself. He knows no other thing until he knows nothing forevermore. He does what he does. And the great man did what he did. He saw the man's weakness, and his strength, and used one to get the other. The great man had the other great men in his pocket. He could call out the guard on a whim. He could kill a man legal. He could kill him any which way. He could do as he pleased. He could live in the shadow of a boneyard in a palace and there were none dared to squeak. The men said we'll vote and stick together, and the great man just put one more man in charge of them, the new black prince of the county with the thing with the letters behind him. It was organized, but not like you'd think. Things would go on behind a velvet curtain. If they drew it back you'd see the smirk of the hyena in there. Then there was no work. The union and the boss alike said no coal. The big machines and the kept men kept even the culm from us. The great man couldn’t mine the coal by himself, so he mined the banks and the government and the union and got his gelt just the same. The great man thought he knew men. But he did not know your father and his father. They knew the coal like he knew his oysters. They went into the woods where the seams lay close to the sky, and they began again. The very earth gave them what they always sought. The men sent to find them and stop them joined them instead. The trucks ran at night to the great glittering city where the coins slept in great vaults. 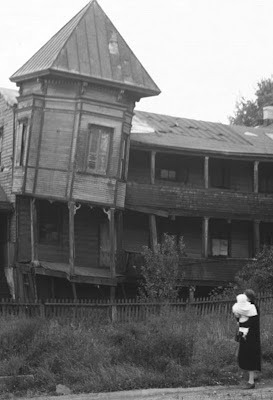 The housemaids knew from where it came, for they had come from there themselves. They pressed the coins into the dingy hands at the alley gate and burned it in their own great man's house. Their little hods filled with bootleg coal made a pyre for our great man. The great man’s house. Look on it. 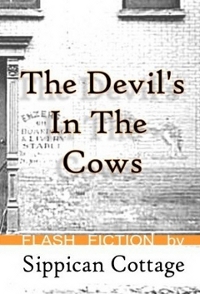 Get your copy of The Devil's In The Cows at Amazon. Now just $7.99! Wonderfully evocative and moving photos, the music that accompanies them is exquisite. I'll order my copy today. You're something else. Hi Bob- Thanks for your kind words, and for visiting often and commenting, and for buying a book. And a table, too. I offer my words and wares, and am paid back in spades by the friendship of the nice people that visit here. I too have been a regular reader for a long time, so long I don't recall how I got here. I've shared your furniture page and your writing to those I know who can appreciate both. Today I ordered the book, and as a customer it's my pleasure to say thank you. Hi Cliff- Thanks for reading and recommending SC to your friends, and for buying a copy of my book. Bought it, read it, enjoyed it. It now resides in our summer home among a coupla' dozen books I leave to entertain, stimulate, and/or enrage my various friends who rent the place. Coincidentally (? ), that's the same summer home that is graced by two classic end-tables crafted by the author with the same precise attention to poetry and proportion that is the hallmark of his fiction. My Uncle Noel, with many of my family, was a miner. He somehow rose to be an engineer, then the chief engineer at his pit. Hi Bilejones- I featured a with Richard Burton talking about his father, the Welsh coal miner, here: What Do You Know About Men? There was coal in Iowa, too. It was the custom, when a man died of a slate fall or was otherwise unable to work, that his eldest son should go into the mine. When my grandfather was injured and it was my dad's turn to go in, Grandpa said no. He wouldn't allow it. None of the brothers ever went in. I never heard the conversation, but I've heard the story. Some men of the town asked Grandpa why he wouldn't let his sons go in. He said he preferred his children alive. Got it yesterday, sat down and read it right through. I'm not saying that you're derivative, no sir, no way...but you have a way of getting inside my head. I'm (re)living it as I read...the cultural touchstones are familiar...the path illuminated by common experiences...however the forks and twists are uniquely yours. Some of your imagery (the rusty bucket brought back an image of my grandfather that I've not recalled for years) will stay with me forever, just as did Bradbury's. Hi Shoreacres- Lovely to see you again. Hi BJM- Thanks for your purchase, and for your kind words about the book. I'm glad you enjoyed it.